Thinking about going global? Dip your toes in with a geo-targeted marketing campaign. Image via Shutterstock. If your company is based in North America, you’re probably marketing to North Americans. Heck, even if you’re not based in North America, you might be focusing your marketing efforts on Americans. We do it at Unbounce. Even though we’re Canadian, we focus our marketing primarily on the USA. We even spell things the way our friendly southern neighbors do (see what I did there?). Not to mention we schedule our emails, webinars, blog posts, marketing campaigns and pretty much anything else based on North American time zones. I wrote a post a few months back titled “Kick-Start Your International Marketing Strategy by Leveraging Your Content.” In it I talked about how investing in a global marketing strategy isn’t as daunting as you might think, nor is it rocket science. It’s about taking what works and doing more of it. Part of that strategy outlined hiring a local marketer, a “mini CMO” or a full-funnel growth marketer who is also a massively talented “doer” and can crank out impossible amounts of work (like our DACH Marketing Manager, Ben Harmanus, and our Brazilian Marketing Manager, Andrea Amaral). But what about for places such as the UK, Ireland, Australia, New Zealand or — heck — even Canada? Do you hire a local marketer there? Maybe you do, maybe you don’t. But what if I told you that you could implement a localized, geo-targeted digital marketing campaign without having to hire a local marketer or leave the comfort of your office? 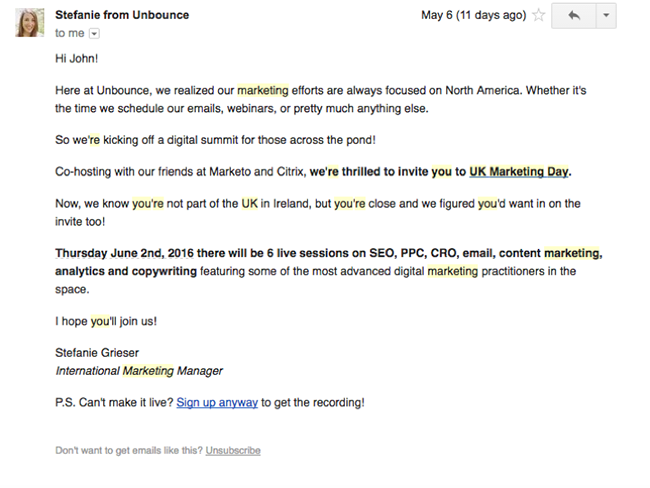 We did it at Unbounce, and you can, too. 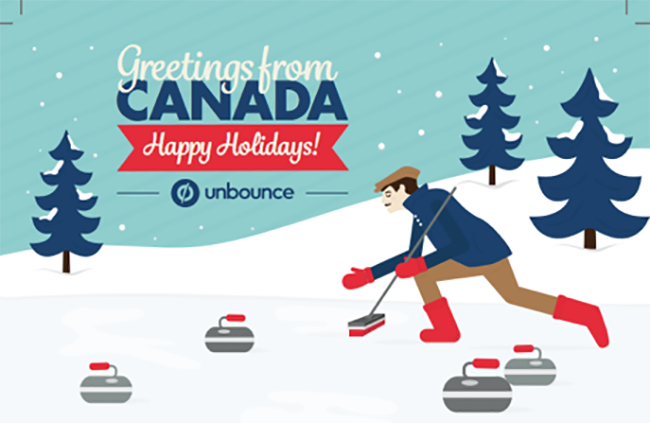 The United Kingdom is Unbounce’s third largest market, right after the US and Canada. Even so, we had never done anything targeted to get more UK business. Nor had we done anything to address their unique concerns as customers (yet). All our webinars are hosted at 11:00 am PST / 2:00 pm EST. 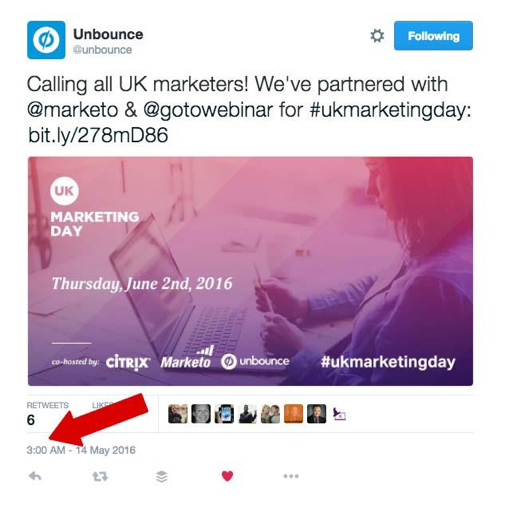 This meant that any savvy marketer in the UK would have to watch a webinar in real-time at 7:00 pm GMT. Right between work and dinner — or wait, should I say supper? Sure, our UK audience could always watch the recording — but what about that feeling associated with watching an event live? What about asking a question during Q&A? What about participating in the Twitter chat in real-time? 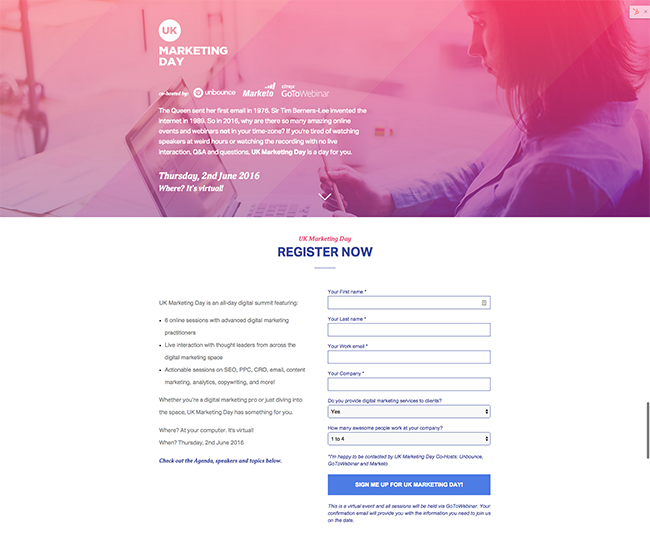 Our UK Marketing Day landing page Made in Unbounce and integrated with Marketo. The campaign idea was simple: to recognize the UK market by delivering something especially for them, a carefully curated online event — a virtual conference — scheduled in their time zone. Don’t have a local marketer (yet)? You don’t need one. Partner with people who are local marketers. 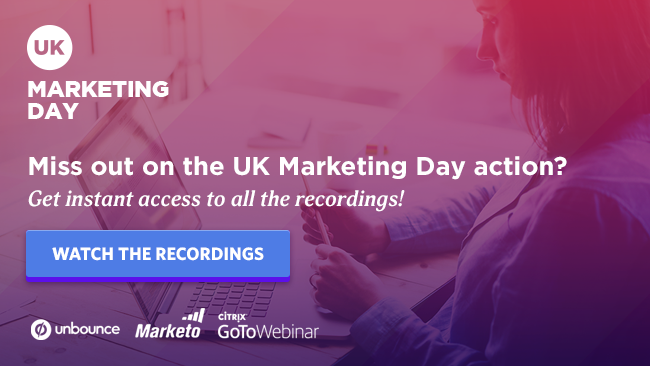 For UK Marketing Day we partnered with Marketo and Citrix Gotowebinar. I know what you’re thinking — isn’t Marketo headquartered in San Mateo, CA? And isn’t Citrix Gotowebinar from Fort Lauderdale, FL? Yep, they are. But they also have UK offices. Which means they hired local marketers who knew the local market and would double and triple check my North American habits. And when you’re doing localized marketing campaigns the devil is in the details. For example, when I wrote the initial landing page copy, I used the date format MMDDYYYY. Gemma Falconer, Campaign Manager, Northern Europe for Citrix Gotowebinar, quickly corrected my mistake before the campaign launched. Oh hey look. 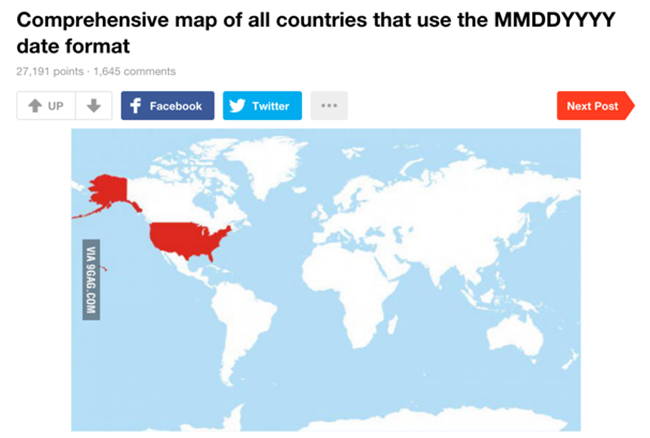 The US is apparently the only country that uses the MMDDYYYY format. Partnering with marketers and companies on the ground not only makes sure your localized, geo-targeted campaign is on point, it’s also huge in terms of reach and exposure. Plus co-marketing allows two or more companies to work on a project together, doing less work for more reward. Who doesn’t want that? By levering the relationships and reach of a partner, co-marketing campaigns are designed to deliver more leads, buzz and awareness, with less work. While we could have just marketed this virtual event to our own UK audience, co-marketing offered us an incredibly valuable ingredient that should be part of every successful marketing campaign — localized or not. Should you get local experts to attract the local target audience? Or should you get international thought leaders? There is no wrong answer here. For UK Marketing Day we decided to go with a mix of both. We wanted to make sure we had a range of international speakers, local marketers and, most importantly, thought leaders who specialize in a range of marketing verticals (such as SEO, PPC, CRO and email). We included Dave Chaffey, a well-known email and marketing automation expert in the UK and Europe, as well as Amy Harrison, a web copywriter based out of Brighton. We would love to join in on the UK love. We actually have a surprisingly large audience over there as well. CRO expert Talia Wolf, based out of Israel, and international SEO consultant Aleyda Solís, based in Madrid, joined the day as well. It may sound obvious, but make sure to market to your geo-targeted audience in their language (watch that North American spelling) and in their time zone. 3:00 am in Vancouver means it’s 11:00 am in the UK. Schedule your social media posts, emails and blog posts (like the one I sent below) during their business hours. And invite their neighbors, too. 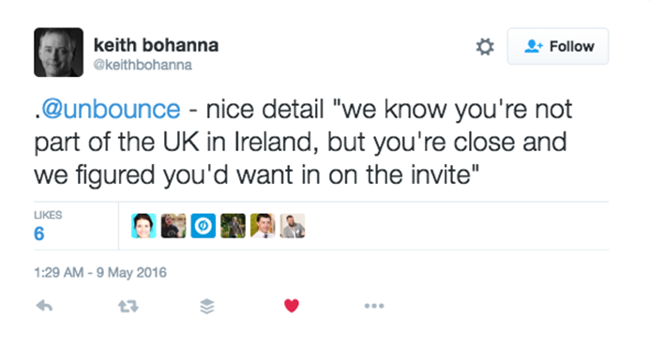 Although we blatantly called the event UK Marketing Day, we made a point to reach out to marketing folks in Ireland. And we ensured our email copy reflected that invitation. The marketing campaign is done. What now? In the pre-marketing phase, I sent an email to our Director of Campaign Strategy. I wanted to talk about what we could do with those fresh UK Marketing Day leads after we got ‘em. UK Marketing Day is coming up. Which means it is going to end. Which means we need to think about nurturing those leads. I would like to chat quickly about a lead nurture track that is keeps in mind localization. The last thing I want is a UK-dedicated marketing campaign and we drop the ball when it finishes. A demo in the UK time zone. The most important element post-campaign? Make sure you don’t drop the ball on the localized marketing campaign you worked so hard to create. If you invite leads to a product demo after the campaign or host a “further down the funnel” webinar, make sure it’s scheduled during their business hours. Is a localized campaign really necessary? You might be thinking why go through all this trouble to create something localized? Is the ROI really there? Maybe, maybe not. You don’t have to start big and hire a full-on dedicated EMEA team. You can also start smaller and initiate a localized marketing campaign. 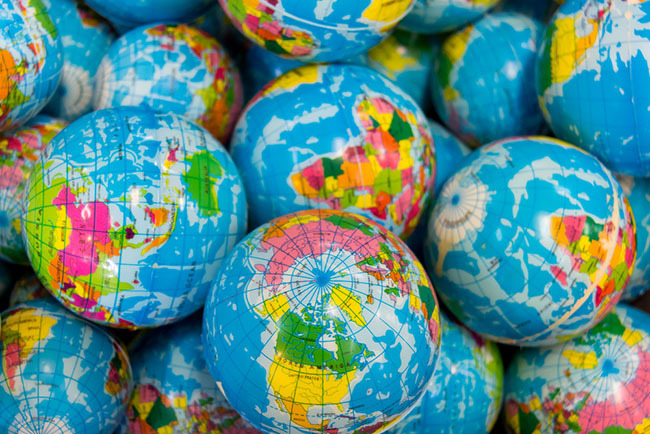 My advice to you: If you’re planning on investing in a global go-to-market strategy, creating a localized marketing campaign before you even hire in that area is a great first step.